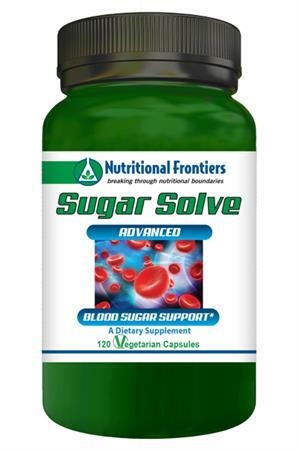 Sugar Solve is a vegetarian dietary supplement to support proper glucose metabolism, cravings and weight management. Chromium Polynicotinate is a niacin-bound chromium complex that has been identified as being the active constituent in Glucose Tolerance Factor, the factor responsible for attaching insulin to cell membrane receptor sites where insulin functions. Individuals who have a deficiency of biologically active chromium may suffer from insulin resistance and higher than normal insulin levels. Cinnamon Extract has been proven in a study published in Diabetes Care 2003 to help reduce blood sugar levels at 1 gram per day. Cinnamon improved insulin sensitivity and reduced blood sugar in those with both Type I and Type II diabetes. Gymnema Sylvestre contains phytonutrients that support the normalization of blood glucose levels and the production of insulin to within normal ranges. Alpha Lipoic Acid is a potent antioxidant that prevents free radical damage and protects other antioxidants such as Vitamins E and C, and Glutathione. It has been shown to support the inhibition of glycation. Glycation occurs when proteins or lipids in the body react with too much glucose to cause oxidative damage. Over time, excessive glycation damage can accelerate aging, promote kidney dysfunction, nerve damage, and impaired vision. L-Taurine helps mobilize fat, reduce sugar cravings and assist the release of insulin. Vitamin B6, B12 and Biotin are all necessary to help process and utilize insulin effectively. Vanadyl Sulfate is a trace mineral which works like insulin to increase the amount of glucose and amino acids driven into the muscle. Vanadyl Sulfate is a compound of Vanadium, Sulfur, and Oxygen. According to a study performed by the University of Texas Health Science Center, San Antonio, Texas in 2001, Vanadyl Sulfate was shown to reduce hyperglycemia, improved liver and muscle insulin sensitivity. EGCG Studies in both cell- and animal-based models suggest that EGCG may mimic and/or augment beneficial metabolic, vascular, and anti-inflammatory actions of insulin. - Very safe and effective for both men and women. - Easy to swallow and absorb vegetarian capsules. - Reduce cravings and maintain weight. This formula is vegetarian and free of citrus, corn, egg, gluten, milk, sodium, soy, wheat, yeast, added sugars, synthetic dyes, artificial flavorings and preservatives. Suggested Use: As a dietary supplement, take 2 vegetarian capsules with food, twice per day, or as directed by your health care practitioner. Available in: 120 Vegetarian Capsules.